Hinsdale is an affluent western suburb located 20 miles west of Chicago and can be easily accessed by I 294 or I 55. The eastern boundary of Hinsdale is I-294. The western boundary is Route 83. 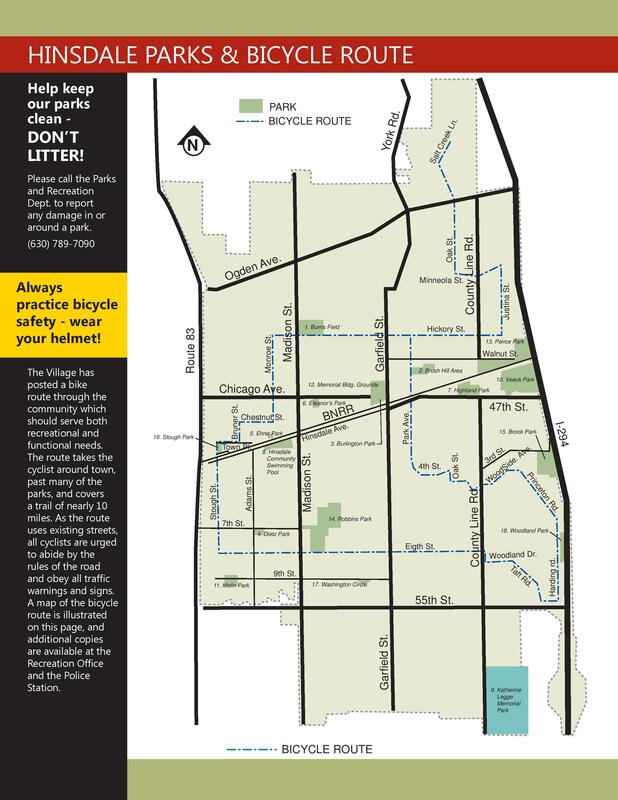 Hinsdale is surrounded by Western Springs to the east, Clarendon Hills to the west, Burr Ridge to the south and Oak Brook to the north. Incorporated in 1873, Hinsdale is an affluent Chicago suburb located mostly in Du Page County but a small portion lies in Cook County. The town is often referred to as the "epicenter" of the tear down phenomenon that begun in the 1980's and spread nationally, with well more than 25% of its homes having been replaced with larger, newer homes mostly valued at $1mm and above. Hinsdale has a quaint downtown that contains boutique shops and restaurants. 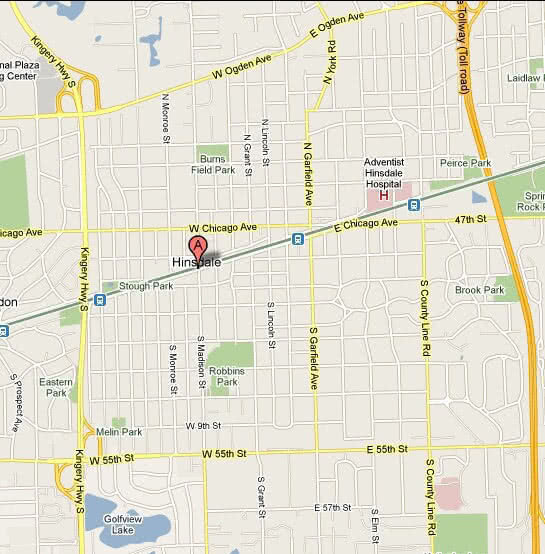 Part of the popularity is because it is only a 20-minute train ride from downtown Hinsdale to downtown Chicago. Hinsdale is also known for its excellent public school system ranked among the best on all levels in the state of Illinois. Hinsdale is considered an urban area with mostly single family homes, some townhouses and a few small apartment buildings. The size of most homes is medium with three or four bedrooms, and the rest being large homes with 5 or more bedrooms. 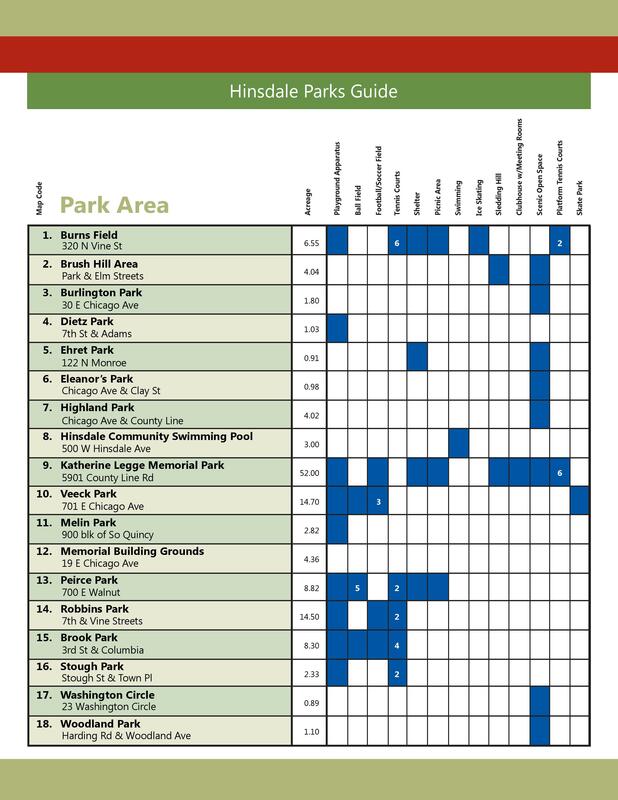 Hinsdale is home to hundreds of properties valued over $1 million. The housing stock is a combination of newly constructed custom homes, well established homes that were built between 1940-1969, and some historical homes built earlier than 1939. Hinsdale is truly a community of fine homes with vast choices in architectural style. The streets have a city neighborhood appeal with large trees arching over many of the streets in the village. Hinsdale has both old and new housing choices in many differing architectural styles. There are homes that were designed by Frank Lloyd Wright, traditional houses with a classic style, colonial Williamsburg style and many many modern mansions. Most homes are owner occupied. Households are mainly comprised of families with school aged children as well as yuppies. Hinsdale is home to some of the top 15% wealthiest folks in the country. As of September 1, 2017 the average days on the market for single family homes is over 125 days. 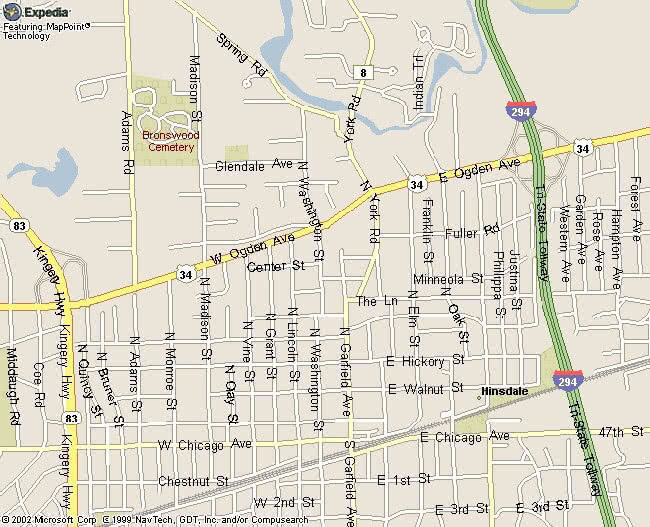 Hinsdale is basically divided into two main areas, the north Side and south side. A home located south of Chicago Avenue is said to be more desirable than one located north of Chicago Avenue due to a closer proximity to the center of town and the Metra station as well as the elementary schools. There are two maps below blown up to show a detailed view of the streets. Considered the most desirable place to buy in Hinsdale by its residents, Southeast Hinsdale is the area approximately from Garfield Street on the west to the Woodlands on the right; the northern boundary is from the train tracks to 55th street on the south. The grade school is Oak School with an average class size is 10-12 students. The average lot size is double to the rest of the town. Rare 1 acre lots exist in this part of town. Hinsdale is known for its fine schools. Hinsdale public high schools are in District 86 and elementary schools are in District 181. Located 17 miles due west of Chicago, Hinsdale Township HS District 86 is comprised of two schools, Hinsdale Central and Hinsdale South, and serves the western suburban communities of Hinsdale, Oak Brook, Burr Ridge, Clarendon Hills, Darien,Willowbrook, and portions of Westmont. These communities are home to a combination of high end retail stores and corporate headquarters and thus attracts professional/executive families that hold high academic standards for both students and schools. Currently serving about 4600 students, the Hinsdale Township schools are known for their award winning excellence.Review the Hinsdale Central Profile and the Hinsdale South Profile. Each year, the State Board of Education releases school report cards for each public school in the state. The report cards include student scores on the Illinois Standards Achievement and Prairie State Achievement tests, and ACTs, demographic information on students and teachers, and financial information on school districts. Review the 2010 state school report card for Hinsdale Central and Hinsdale South. Review the prior years report cards for Hinsdale Township District 86. 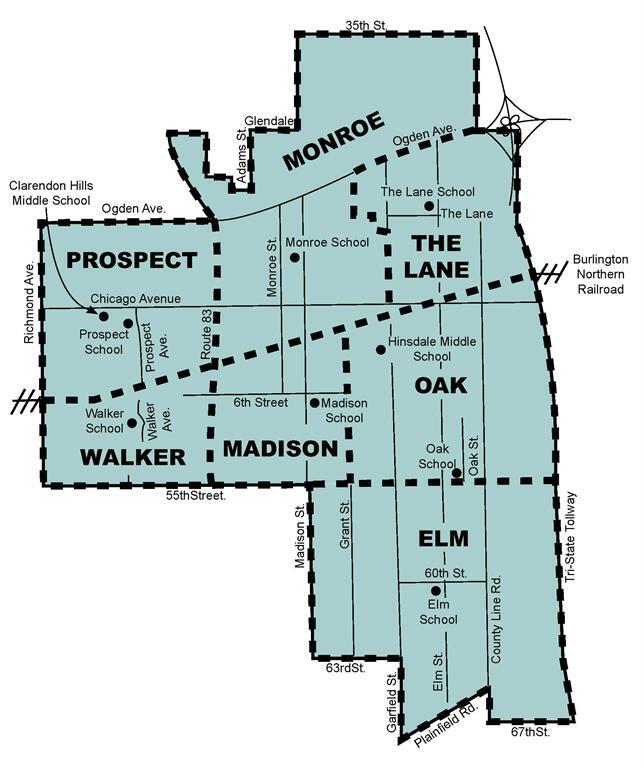 There are seven elementary schools in Hinsdale. Hinsdale is a commuters delight! Just 20 miles west of Chicago, between Interstate 294 (Tri-State Tollway) on the east and Route 83 on the west, Hinsdale is easy to find and access. 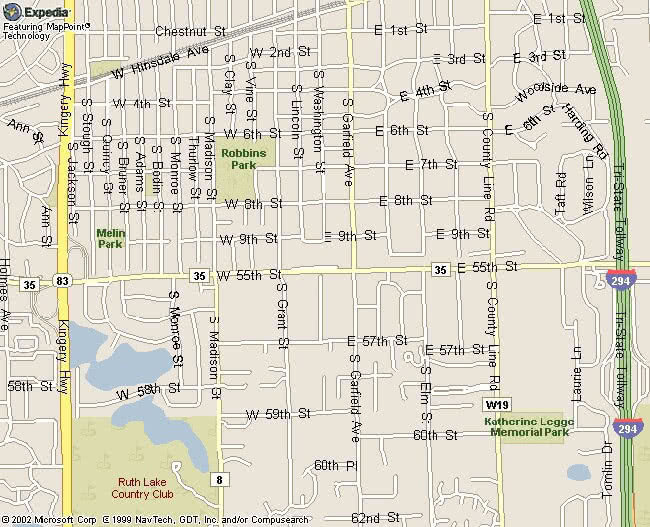 The southern boundary of Hinsdale is marked by 59th Street but the Northern boundary cuts along Ogden Avenue. The map below indicates the borders. Burlington Northern Railroad Metra has three stations in Hinsdale. 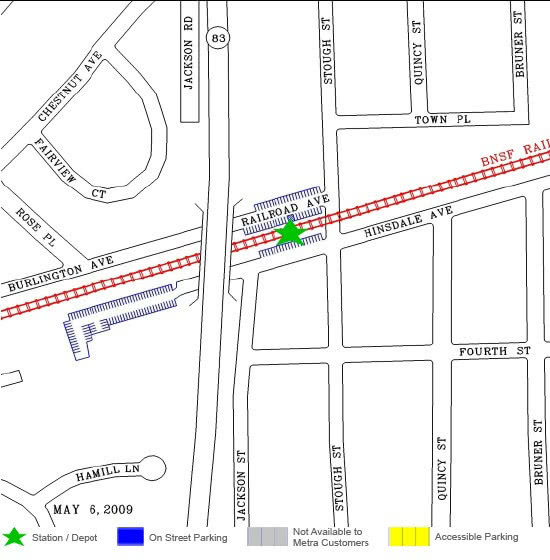 In addition to the main downtown station located at 21 E Hinsdale Ave where there is an agent on duty Monday through Friday 5:30 AM to 1:30 PM, there is the West Hinsdale station located at Hinsdale and Stough and the Highland station near the east side of town located at1/4 mile North of the Intersection of County Line Rd. 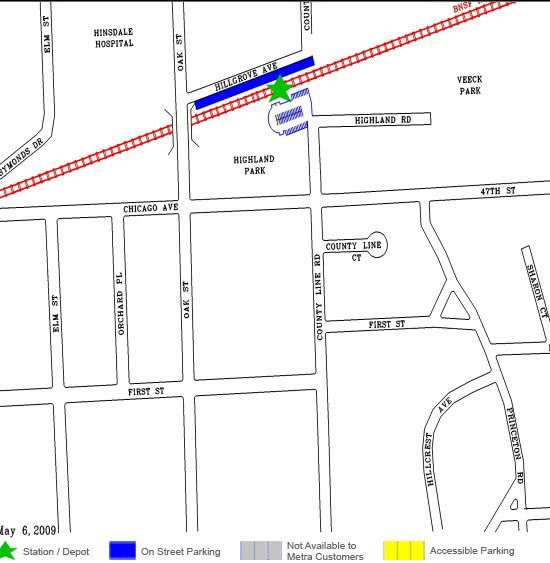 & 47th St.
See map below with the blue marker indicating the location of the stations. The "A" marker represents the center of town.